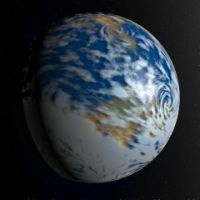 A rendered conworld, as would be seen from space by an observer. Conworld is a shortened form of constructed world. Thus, "conworlding" is world constructing, the art of creating entire fantasy worlds out of your fertile imagination. The ideal conworld is one with depth, consistency, and beauty, which is why Tolkien's Middle-earth is often held as the best existing example of a conworld. But conworlds are usually as beautiful as they are difficult to make. Conworlding is a many-faceted process, and can be divided into a large number of sub-fields, each of them with its own enthusiasts. For example, conlangers are people who like to make their own languages (known as conlangs, short for constructed languages). Conmappers like to draw maps of fantasy worlds. Consports enthusiasts dream up games that might be enjoyed in a fantasy world. In general, the prefix "con-" in front of any real-world field turns it into its conworlding counterpart: conmusic, conart, conpoetry, conhistory, consocieties, conreligions, conphilosophies... the list goes on. Name any area of study, and chances are that a conworlder has dabbled in it already! Many people have had conworlding ideas before: a sketched map, a drawing of an outlandish race, or a simple secret language. At this point budding conworlders ask: "Now what?" So I have a map — How do I decide where the mountains go? How do I make the language sound cooler and less boring? How do I make up impressive mythologies? Can I create music that doesn't sound like any sort of music on earth? It might seem that for really thorough answers to those questions — if you don't care how much time or effort it takes to get them — you would want to research the actual branches of science that deal with those things: geology, linguistics, anthropology, music theory, etc. Doing it that way could take an enormous amount of time and effort, though. These are all huge subjects, and the things about them that are of most interest for conworlding may not be the things that are of most interest to specialists in those fields. Details that would be of great value to you may be buried in a sea of details. High-level insights of the sort you need for conworlding may be entirely absent from the literature of the subject, because the sorts of alternative situations that matter to a conworlder may not be what experts in the subject spend their time on. What you need is a guidebook, not to the whole subject, but to the things about the subject that especially matter for conworlding. That's where this series of books comes in. We'll tell you what you need to know for conworlding, skipping over the superficial tourist traps, and including the really interesting sights that aren't on the standard tour. So pick an area that interests you, and start creating! This page was last edited on 25 July 2018, at 18:01.